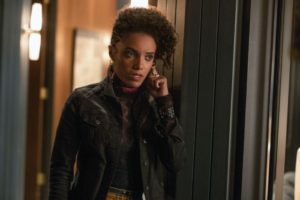 While the other shows were off dealing with the annual crossover, the redheaded stepchild of the Arrowverse decided to host its own Elseworlds in “Legends of To-Meow-Meow” following Constantine’s (Matt Ryan) accidental rewriting of history in the quest to save his lover Dez and Charlie’s (Maisie Richardson-Sellers) powers. Thus began another Legends of Tomorrow specialty: a wacky, nonsensical adventure that was nevertheless full of heart. “Legends of To-Meow-Meow” picked up right where the previous episode picked up, with Charlie sending the cat version of Zari (Tala Ashe) back to the Waverider before paying a visit to Vegas in the 1960s. Unfortunately, her vacation was cut short by a vicious and violent version of the Legends known as the Custodians of Chronology who shot down her Leprechaun friend without remorse. Ray (Brandon Routh), Mick (Dominic Purcell), and Nate (Nick Zano) had somehow become cold-blooded killing machines due to Sara’s (Caity Lotz) death at the hands of the bloodthirsty unicorn in the season premiere. Or at least that was what Charlie and Constantine deduced, as they raced to only set time right enough to put the team back together without having to give up either Dez or shapeshifting powers in the process. Of course, things are never what they seem with Legends of Tomorrow, so it was not a simple matter of eliminating a unicorn in order to get away with breaking the timeline. The episode jumped from one reality to the next as the Waverider’s most mischievous members continued trying to avoid the consequences of their actions, with Zari acting as the voice of reason throughout whether she was in cat, human, or puppet form. And while most of the hour was spent trying to fix the moments without Constantine, his importance to the team wasn’t the only one that was highlighted in “Legends of To-Meow-Meow.” It was Charlie who first made Sara and the others realize that magical creatures could be human too, and without her onboard they could easily slide down the slippery slope towards cruelty and chaos. All roads lead to Charlie. As much as the episode was an important life lesson for both Constantine and Charlie, it was also an endless parade of greatest hits. Sara, Ava (Jes Macallan) and a humanoid Gideon (Amy Pemberton) made up the bloodthirsty Sirens of Space-Time with Hank Heywood as their very own Bosley in one timeline, for example, while half the team sang the Puppets of Tomorrow theme song in another. Charlie also took on the forms of Gary and the Fairy Godmother, among many others, which led to some hilarious moments of out-of-character behavior and an adorable sequence in which Gary believed he was talking to his future self. And yet the humor was balanced perfectly against more heartfelt moments such as Ava’s reaction to Sara’s death or Constantine’s attempts to convince Dez that their break-up from moments ago was actually leftover from ages past. Continuing from the emotional thread in last week’s episode, the center of the story still revolved around Constantine’s still-doomed romance with Dez. Their love story restarted in a climactic kiss that returned the world to its natural state, but it also provided one hell of a cliffhanger when Hank was revealed to be working with the demon Neron (who happened to be occupying Desmond’s body). 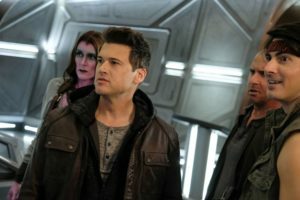 The revelation is sure to send John into another spiral when Legends of Tomorrow returns in April, not to mention set Nate’s relationship with his father all the way back. Hopefully the next episode will also explain whether Mona (Ramona Young) ended up surviving the slash on her belly after time was written back to its original form.